With a high concentration of amino acids, the stinky bean fits best to its name. The smell can pass the methane gas but in a scrumptious way! Though it seems oddly enough to say but I can assure you that stinky beans probably one of favourite beans in Indonesia ha ha. TRY at your own risk or better skip it if you're in a doubt :-)!!!! 1 Wash the stinky beans & set aside to drain. 2 Deep fry dried anchovies till golden brown and crispy, set aside to drain. 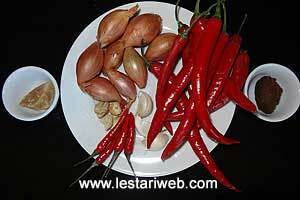 3 Put chilies, shallot, garlic, tomato & dried shrimp paste in a blender or food processor & blend into smooth paste. 4 (If necessery add a little bit oil to help the blending process). 5 Heat 4 tbsp oil in a wok or saucepan. (Don't add oil if already added in a blender). 6 Add blended chili paste, galangale, lemon grass, and bay leaf. 7 Stir-fry over medium heat until fragrant and oil begins to appear on the surface, take about 10-15 mins. Stir occasionally. 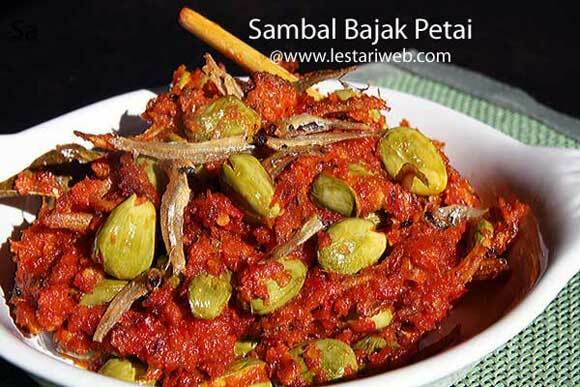 8 Add stinky beans when the liquid is evaporated & sambal becomes drier. 9 Add the tamarind juice, salt & sugar. Stir to mix & cook over low heat for another 5 minutes. Stir frequently. 10 Add the fried achovies, stir to mix. Adjust the seasoning, add salt or sugar if necessary. Remove from heat.